25 years of Silly Walks – in marriage, that would be a silver jubilee. 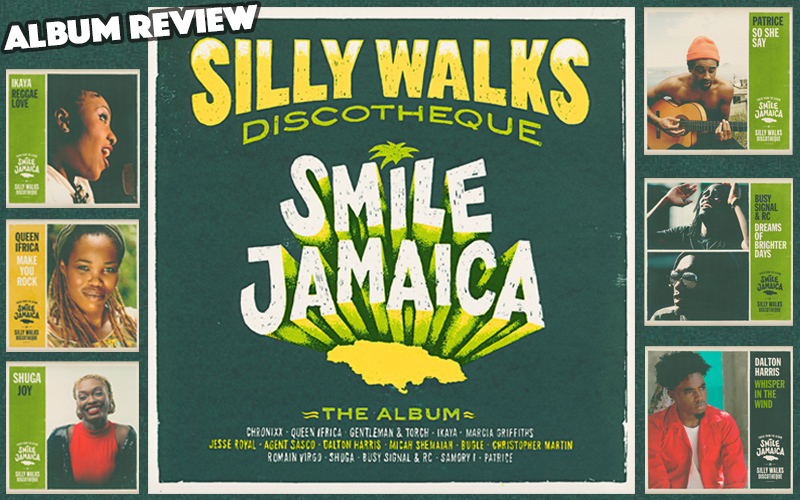 Occasion enough for the diligent soundbwoys to put out a new album which actually deserves gold: Smile Jamaica! But wait, don't we know this title? Exactly, it's the name of the Chronixx track that propelled Silly Walks' Honey Pot Riddim to every corner of this world a few years ago and, as Oli and Joscha unanimously agree, "changed everything". Since it was never released on an album, it became the title track of this one. Likewise, Dreams Of Brighter Days by Busy Signal and RC is one of the sixteen tracks contained. Other songs you might already be familiar with include a cover-version of Roots And Culture, gloriously recorded anew at Tuff Gong Studio with the characteristic, slightly cheeky slur of Jesse Royal. They couldn't have found a better interpreter for the Mikey Dread original. And there's another one that has seen the light of day before: Marcia Griffith's Holding You Close, a really extraordinary piece that was originally recorded with Austrian Dubblestandart, now shines in new glory on a Silly Walks remix. Another great female voice (and another great remix) is Queen Ifrica on the Clocktower Riddim who will Make You Rock. Also, the beautifully crafted instrumental of the Evolution Band which already took my breath away on Clay's Hold On makes my heart skip a beat again when Romain Virgo sings Unbreakable. The other tracks are brand new material for which Silly Walks, the Evolution Band and Jr. Blender take responsibility. Perfect opening track, newcomer Ikaya tells us a few good things about our beloved music in Reggae Love. With Micah Shemaiah and Samory-I they present two more relatively new artists who deserve a whole heap of airplay. Especially the way the deep dub remix of Russ Disciple ends both the latter's song I Am Gad and marks the end of the album, is a revelation. My discovery of the release, however, is Dalton Harris. A name I've never heard before, this amazingly talented young singer manages to bring back the magic of grand, soul-tinged reggae vocalists with Whisper In The Wind, a magic that is definitely evoked by the analogue recording equipment of Berlin's Joy Sound studio, too. The album is bustling with more well-known names including Patrice, Bugle, Christopher Martin and Shuga, who lives up to her name with the sweet Joy. Agent Sasco holds the honour of the first visual release – his powerful Never Let Them Break You Down is out on video already. And, of course, Gentleman can't be left out on a Silly Walks production. He joins powers with Torch to deliver the urgent, uplifting message Keep On Moving. Niceness! More than an hour of sonic bliss is coming your way with Smile Jamaica, so make sure you get a copy and join the anniversary celebrations!